Dive into life in the beaver pond! 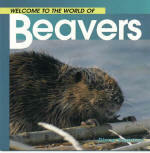 From how a beaver builds its lodge to how it gnaws down tall trees, this book reveals amazing animal facts. Did you know that a pair of beaver can build a small dam in 24 hours? Some dams are so strong, a horse could walk across them. These color photographs and intriguing text reveal rarely seen moments of beaver life. This is a new book from an independent bookstore.